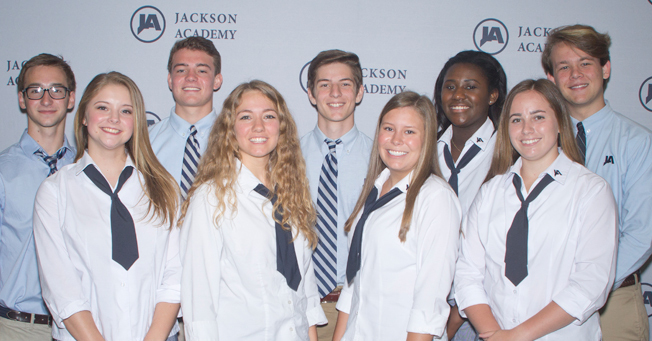 Announced each year during Upper School Awards Day, Hall of Fame recognizes seniors who exhibit superior qualities of leadership and citizenship, versatility in activities, service to Jackson Academy, and scholastic achievement. Hall of Fame is awarded to students who by their attitude and integrity exemplify honorable standards in all areas of school and community life. Named to the Hall of Fame for 2015-16 are (back, from left): Ford Williams, Hays Rogers, Dalton Gibson, Hayley Murphy, Tyler McClellan; (front) Hannah McCowan, Rose Maxwell, Georgia Gibson, and Robyn Hadden.